Newspaper (98 pgs) One page article written by George Nelson on JLA/AVENGERS, with interview and quotes from George Pérez. This issue of the world's longest-running magazine about comics includes the following: a piece on JLA/Avengers; Catching Up with Bob Rozakis; "Superman's Trials and Tribulations"; plus the usual reviews, news items, and more. June 6, 2003. Cover price $3.99. Publishers of the long-awaited JLA/Avengers DC-Marvel crossover should be closer to setting a release date within a few weeks, artist George Pérez said at April's Pittsburgh Comicon. "This is going to be a very, very intensive two months," said Pérez, who is penciling and inking the crossover, written by his fromer Avengers collaborator Kurt Busiek. "It will be very nice in 2004 to be able to draw one page a day, five days a week, because that's all that CrossGen ever wants as output from their artists." Pérez draws Solus for CrossGen. The first two issues of JLA/Avengers are pencilled and inked, and Pérez has pencilled all but four pages and inked 16 pages of #3. Covers have been colored, as well as all of #1. the plot for the fourth and final issue also has been approved. "The book is definitely coming out the last quarter of this year," he told CBG. "As I've told many people, I refused to have this as the cover feature for Wizard's 2004 preview. It's been the cover feature now for two years. I've got to get that book out." The Avengers have 81 members, honorary members, and hangers-on - and the JLA includes more than 100. "As Kurt Busiek put it, when people say the Avengers have pretty low standards for members, the JLA have none," Pérez joked. "And, as was my desire - and they're honoring it - I wanted every single character who's ever been a member of either group to be in this book." There may be another 200 characters who have cameos. In the last issue alone, close to three dozen super-villains appear who had not previously shown up in the story. 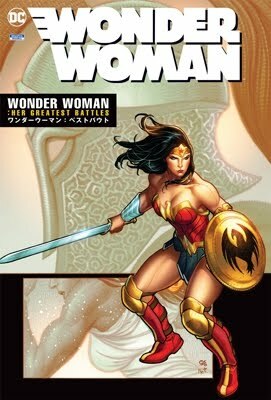 Though he would not disclose plot details, Pérez said the story - which takes place, he quipped, on "Earth-$" - has time - and dimension-spanning aspects that allow him to draw things that he would not have had the opportunity to draw, if he had to stick to literal timeline, such as Wonder Woman with an eagle on her bodice. "When I was in issue #1, when I got to draw the Spectre, I said, 'OK at least Hal Jordan does appear.' Little did I know what Kurt had in mind. I get to draw the classic Green Lantern in the classic costume - even the one without the shoulder epaulets and the V-shapes: the very, very early version of his costume." Even Heroes Reborn versions of the Avengers might appear. Yes, Kurt is going to try to make this as logical as possible, but there's going to be some stuff you're just going to have to, as Marv Wolfman said, spray the fairy dust on and let your imagination run wild," he observed. "We're going to have fun with this book. It's a lot of work, I hope it's going to be worth the wait for you. For me, I'm just looking forward to not having to answer, 'When is JLA/Avengers coming out?'" Locations for the story include the Flash Museum, Asgard, Avengers Mansion in its different incarnations, and the various headquarters of the JLA. It also include nods to the original version of JLA/Avengers, started in the early 1980s but never published. Announced in 2001, the crossover has been the subject of much speculation regarding its eventual release, and Pérez acknowledged that he had hoped the four-issue mini-series would have been finished sooner, as well. "When people ask why this book is taking so long, a lot of them don't know that I'm inking myself - so, when they find that out, suddenly all is forgiven," he said. He added that he has had to take on outside work to be able to afford the project, noting that his income dropped 60% during the year he worked on the series exclusively. He acknowledged that fans might be tiring of news regarding the project but said he thinks that will be taken care of, once an official release date is announced. "There have been a lot of false dates. Fans have made assumptions based on the Internet version of 'telephone', where news was actually disseminated incorrectly that there was a release date. No, there was a hoped-for date. I had hoped to get this book done a lot sooner, but it became apparent that, if I wanted to earn a living, doing this book alone without something to supplement my income was going to be a financially disastrous for me." He said the project is moving faster with DC Executive Editor Mike Carlin stepping in as DC's editor. He described former Editor Dan Raspler as "a bit of a tehnophobe," which slowed down approval of coloring. "Another great thing about having Mike Carlin involved - having nothing to do with Dan's ability or any disagreements - is that Mike Carlin was the late Mark Gruenwald's assistant editor, when Mark was the editor of the original JLA/Avengers, so Mike, is the only other personal involved other than me from the original. Having worked with Mike, I have a great, great respect for him as an editor: the type of editor who believes that, if you hire good people, let them do their jobs," he continued. "If he has suggestions, he'll be the first to tell you, but in the end he says we all have to be happy with the book." Pérez said he is satisfied with the work by colorist Tom Smith and remarked that working with Busiek reminds him of working with Wolfman: "The greatest compliment I can give to any writer."